Screams echo around the two brothers as they look at each other and stifle giggles under wide grins. One reaches forward and types something into the computer. The screams from the two women in the padded grey room grow louder — the brother’s soft giggles do the same. Around Edmonton, Nathaniel and his brother Alex are referred to fondly as the VR brothers. The two make up a company called VR Cave, a start-up focusing on virtual reality. Their latest and most ambitious undertaking, Hospital of Horror, is currently scaring the wits out of Edmontonians in a small room provided to them by the entertainment company FunEx. While to the naked eye the room seems plain, to the brothers — and the people consistently screaming — the room holds all the possibility in the world. “The easiest way to describe virtual reality is being teleported into the video game,” explained Alex. To make the ‘teleportation’ happen, the brothers first have to isolate your senses. 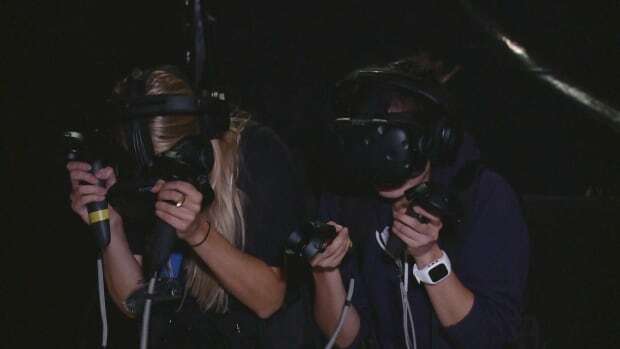 On your eyes goes the HTC Vive headset, which will transport you to the hospital. Over your ears go noise cancelling headphones that will only allow you to hear your partner, and whatever the brothers want you to hear. Then they place a backpack on you that will allow you to be tracked by the software with no cords. The brothers point you to a corner in the room, an elevator in your eyes, and sneak out. Then the real “fun” begins. To get some mighty fine scares, Alex and Nathaniel studied up on the latest in horror. They read several books on how to scare people, played indie horror games and tested their ideas over and over to figure out how to best freak out their customers. 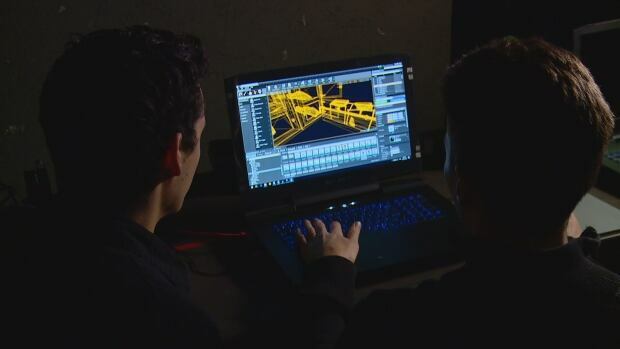 “I knew a lot of the techniques that work in a computer game wouldn’t work in the real world, and this is really a blending of the two together,” said Nathaniel. “We can do things in our game, and we felt we should do things in our game that you can’t do in a real haunted house or would be way too dangerous — things flying at you, sharp and pointy things coming at your face. The boys say some who enter their room of horrors scream, others laugh nervously, and some, well some just stand silently — frozen by the fear. It’s the screaming the brothers like the most. The birth of one of the most cutting edge VR experiences in the world was created in the basement of a south Edmonton home. The two say they are pretty much self-taught in this particular avenue of coding. Hospital of Horror was the second game developed by the brothers. The first, entitled VR Ninja, took them about eight months to develop in which they learned the ins and outs of VR development. Alex said the fact that they are brothers allows them to get work done quickly. What sets this creation apart from the rest on the market is the fact you’re not getting the bejeezus scared out of you alone. The majority of experiences and games developed for VR are aimed at a solo experience. The brothers decided they wanted to shake it up because for many gaming is more than just a solo experience. A few years ago, the brothers said it felt like the technology and computer power just weren’t there, but now it seems like the possibilities are virtually endless. Which is good, because VR has been a long time passion for Nathaniel, who studied tracking human motion during his PhD. “These original ideas, I had years ago, I started thinking ‘I think this would all work now, we could totally do this,'” he said.